Happy Mardi Gras, Pancake Tuesday or Fat Tuesday.... or just Tuesday. We knit for Christmas, Easter and other holidays so why not Mardi Gras? 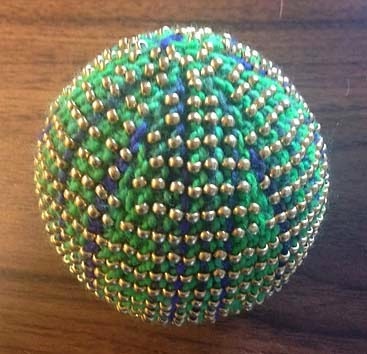 I'm making one of these Mardi Gras balls each year until I fill a big bowl with them. Each year there will be a new and different one. If you want one, too, go here or here. Jackie has made a fun and excellent pattern. I only made one change. Instead of filling it with a cotton stuffing I put it over a 2-1/2 inch styrofoam ball because it's not going to be used a stress ball but as a home decoration. Laissez ... les ... bons ... temps ... rouler! !